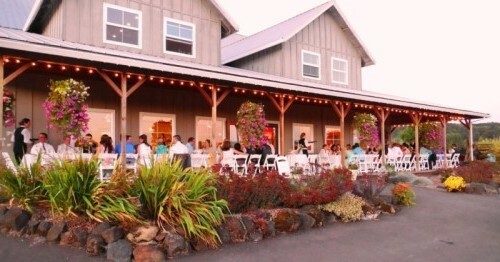 After being recommend by Laurel Ridge Winery, Jocelyn and Zach selected Voila Catering for their wedding for our ability to manage all the wedding and reception details for them and for our wonderful chef-created food. The planning process started with a complimentary lunch at our first meeting where we discussed their initial ideas for schedule, flow and layout, decorations, flowers, and food. As part of our services with Weddings By Voila, we did a site visit to walk thru the layout, select linen colors to go with the venue, and measure Laurel Ridge’s patio to ensure that the tables would fit comfortably for the guests. Voila planned and managed all the ceremony chairs, dining tables, linens, and items needed for the family style dinner and arrived early to set everything including flowers up. 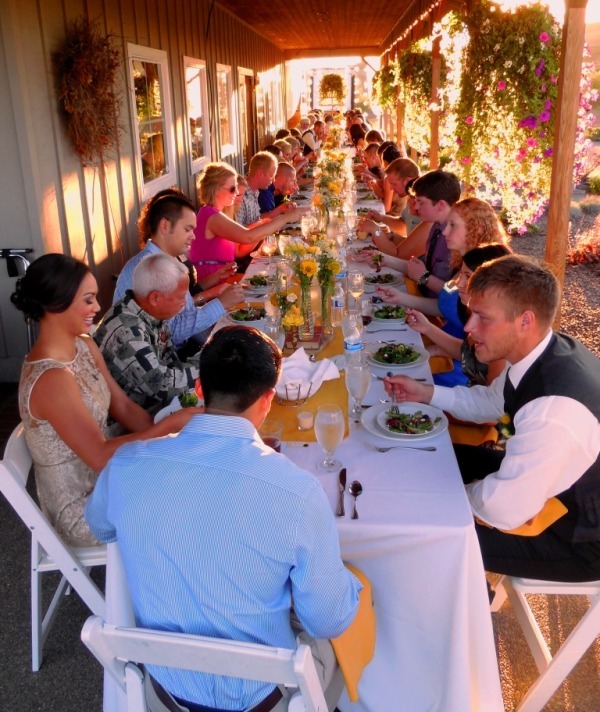 Jocelyn and Zach wanted the a social family feeling for their wedding reception dinner at Laurel Ridge Winery so Voila Catering’s family style service was the perfect choice. 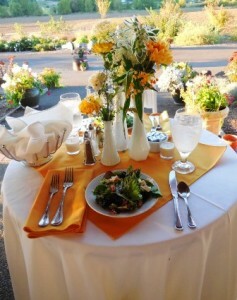 With access to the only rental company with 36″ wide tables, we were able set the long tables down the patio of Laurel Ridge and have enough table space for centerpieces, food platters, bread baskets, and water carafes plus have room for our service staff to deliver food and clear plates without bumping into the guest’s chairs. Our attention to details makes our events smooth and enjoyable for your guests. The newlyweds enjoyed dinner at their own sweetheart table in the middle of all the long family style tables. This seating choice can be a good idea when the bride and groom can’t sit with all the important guests or when there are complex family dynamics. After the ceremony, our service staff passed several hors d’oeuvres during the social period while the guests enjoyed the wines from Laurel Ridge Winery. 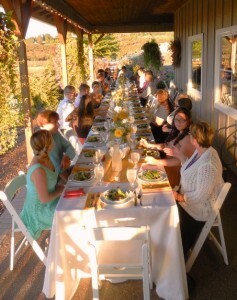 Guests were then seated to a Summer wild greens salad with local blackberries, candied walnuts, and creamy Chevre cheese drizzled with our own Balsamic Vinaigrette. Served with Laurel Ridge’s wines, the first main entrée course for dinner was a Garlic and fresh Rosemary Roasted Chicken Breast served with Summer Zucchini, Yellow Crookneck Squash, sliced Eggplant and Roasted Tomatoes. The second course was a Apricot and Caramelized Onion stuffed Pork Loin with a Rosemary-Apricot Glaze and Garlic Roasted Red Potatoes. To achieve Voila Catering’s very high food quality standards, all food was cooked by our Chef team from a raw state in our portable commercial ovens at Laurel Ridge Winery. After the Family Style Dinner catered by Voila Catering, newlyweds did the traditional cake cutting with cupcakes for the guests! Dancing followed with a DJ while the Voila team cleared the dinner. 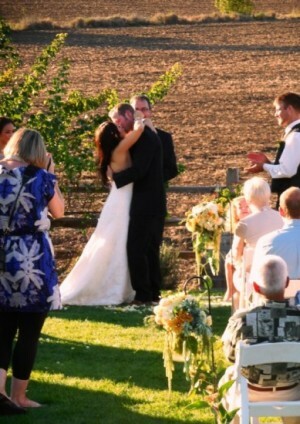 After a couple hours of dancing, the couple escaped off for their first night together as husband and wife while the family reflected on a wonderful and easy wedding at Laurel Ridge Winery. At the end of the night, all the family had to do was to load the gifts, give away some flowers, and take some extra food home to enjoy!